WE WON: NY State DREAM Act PASSES During Immigrant Advocacy Day! Yesterday, we witnessed history unfold when the New York State DREAM Act passed the Senate 40-20, followed by the Assembly 90-37. The bill will allow ALL immigrant students the access to state-level financial aid they need and deserve to pursue higher education in New York. The vote puts an end to years of political gridlock by anti-immigrant forces as the Senate approved the DREAM Act after years of inaction. When signed by Governor Cuomo, New York will join Texas, California and New Jersey in ensuring students equal access to higher education regardless of immigration status. Thousands of undocumented high schoolers across the state, including Korean/Asian immigrant students, will now graduate with fairer and greater opportunities regarding their futures. This long-fought victory would not have been possible without the tireless work and support of our community members, community-based organizations, activists, legislative allies, and DREAMers themselves. We share our celebration with everyone who joined us to demand and advance immigrant and educational justice for our students. Yesterday was also the New York Immigration Coalition-led Immigrant Advocacy Day in Albany. 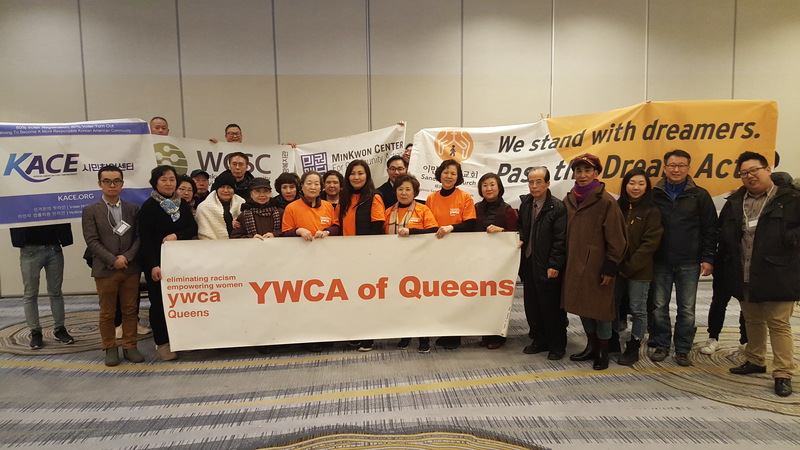 We traveled to Albany with the YWCA of Queens, Korean American Civic Empowerment, Wonkwang Community Service Center and the Korean American Sanctuary Church Network, and local community members to advocate for immigrant rights. The passage of the DREAM Act is only the first step. We will continue pushing for driver's licenses for all, housing justice, and more to achieve economic and social justice for immigrants. Thank you for support during this important fight!